Experience your designs virtually before they are built. NIEDS is the most trusted AutoCAD 3D Training Institute In Delhi. We have helped a great number of engineers in realizing their dreams of becoming AutoCAD drafters. We’ll teach you all the basic concepts and help you in visualising your design beforehand. AutoCAD is a powerful tool, which can help you in designing various engineering projects. It is also capable of generating a file for 3D printing. Our 40 Hours AutoCAD 3D Courses will make you capable of leveraging the power of this tool to transform your ideas into reality. If you are convinced that it is the right choice for your career, then don’t hesitate to call us to book a seat for yourself. 1. 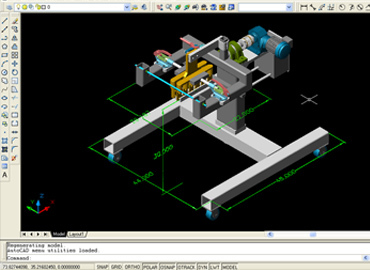 Basics Of 3D CAD.
. Viewing Of A 3D Model.
. Adding Thickness To 2D Objects.
. Solid Modelling Definitions And Concepts.
. Controlling The Appearance Of Solids.
. Slicing A Solid Along A Plane. 4 .Working With 3D Coordinate System.
. Understanding 3D Coordinate Systems.
. The User Coordinate System.
. Working With Multiple UCS. 5. Creating Composite Solid Model.
. Concept Of Composite Solid Model. 6. 3D Concepts : Advanced Levels.
. Named View In 3D. 7. Working With Layout Feature And Layout Tab.
. Layouts: A New Look For Plotting.
. Creating A New Layout. 8. Working With The View ports Dialog Box.
. Creating Profiles From Solids.
. Use Of Vernier Calipers, Micrometer And Gauges In Component Development.
. Generating Production Drawings For Assemblies And Individual Component.